The phrase, crafted in the middle of the night, would become the namesake of Eidinger’s first solo EP, “My Legs Are Growing,” a project consisting of four songs she created after buying her own drum kit and finally having access to all the instruments, production tools and collaborators she needed to make it possible. Eidinger, a communication major, has been playing music her entire life. In college, she’s been part of the a cappella group Pitches and Tones, as well as the band Yes Yes A Thousand Times Yes, who she played her last show with in October 2016, before quitting to create her own music. “My Legs are Growing” came out Sept. 25, on Bandcamp. Navigating the uneasiness of growing up and self-discovery, Eidinger blends catchy pop music with clever lyrics, all highlighted by bare instrumentals which she records herself. But now, with graduation looming, the self-produced, genre-bending musician is combining all of her talents to embark on a solo career. AllegrA, the name of Eidinger’s full solo outfit, had its first live performance two weeks ago in front of a crowd of about 40 people at the Mr. Roboto Project. A one-foot-long platform extended from the back corner of the dark room, which was lit only by string lights dangling from the ceiling. The audience’s mood changed with the music, from the dreamy acoustic sounds of a band called Soda Club, to the head-banging, playful rock music of Manic Pixi. Alexa Grazio, a friend of Eidinger’s in attendance for the release show, came to see the end result of the countless hours she spent on her couch, listening to Eidinger mess around and make music. Getting involved with AllegrA was a matter of chance for Garrett Grube, who plays drums for live performances, the only time it’s impossible for Eidinger to do everything solo. On an otherwise ordinary day a few months ago, Grube heard a neighbor playing music through the walls of his North Oakland apartment. Following the sound, he knocked on the door where it was coming from and Eidinger answered, inviting him in for a jam session. Later on, Eidinger and her bandmates finally ascended to the stage for their long-awaited debut performance. Though holding a guitar that was nearly bigger than herself, Eidinger’s voice filled the room during her set, captivating the audience nonstop throughout the rest of the night. For Eidinger, realizing that dream just seems logical. As a kid growing up outside of Philadelphia, Eidinger, nicknamed “Legs” for her tiny stature, was surrounded by music. Her dad was a drummer and her mom was a singer. Music caught up with her at every corner — her family sang “Happy Birthday” to her in four part harmony, while her dad could be heard beatboxing, making drum sounds throughout the house. Eidinger decided to take it a few steps further, learning bass, drums, guitar, keys and singing as well. Eidinger’s father, Ken, owner of the Independence Drum School and a musician in his own right, noticed his daughter’s musical ability from when she was barely old enough to walk. With a name like Allegra, a variation on the musical term Allegro, meaning brisk or rapid in tempo, Ken believes that his daughter’s interest in music was almost guaranteed from the day she was born. After years of building upon that raw talent, Eidinger found the time to create a full EP from her self-made basement studio, comprised of her drum set, guitar and the rest of her instruments. For hours on end, Eidinger disappears into her studio, recording each instrument and vocal separately, then playing with the sound on her computer’s music production program until she’s satisfied. Her production skill came at an early age, too, recording music and putting it on the internet when she was 15. Back then, in order for Eidinger to create the sound she wanted, she would beatbox in place of drums and record through the microphone on her laptop, playing mostly ukulele and a bit of guitar. “It feels like I wake up when I’m done.” she said, describing the feeling she now gets after working through and perfecting a song. More than simply songwriting and performing, Eidinger focuses intently on the composition of her music, and how every aspect comes together to form a complete song. Today, she describes her sound as “floaty rock, a little bit dreamy, a little bit surfy, but with a lot of clean guitar.” Niccolo Dante Porcello at Post-Trash online had compared it to the music of alt-rocker Courtney Barnett, but Eidinger’s sound isn’t something affixed to any one genre. With resonant vocals and simple melodies throughout, Eidinger’s music remains upbeat while expressing a sense of uncertainty and longing. Her witty lyricism is soulful and simple, conveying its message in just a couple of words and phrases. In the third song on her EP entitled “Pass it Back to Me,” Eidinger sings, “Build the fantasy up / knock the cards down / and flip them over / do you feel like a queen?” In this song, Eidinger emanates a somewhat resigned sense of wistfulness, waiting for someone to reciprocate her own feelings. It’s no surprise that she likens performance to poetry. Eidinger seems to have a poetic approach to her lyricism that complements her rhythmic upbringing. Grube always looks forward to playing with Eidinger and her quiet and clean style, which sets her apart from most musicians he’s encountered. Two years ago, Eidinger joined the indie rock band Yes Yes A Thousand Times Yes as a bassist. The band came together in late 2013 and now has more than 1,700 likes on their Facebook page. Last June, they released a record called “Not Once, Not Ever” with Broken World Media. The band went on tour throughout the East Coast and parts of the Midwest, and Allegra remembers conditions being less than ideal. At one particular show in Maryland, the bar where they were scheduled to play had far less equipment than the band needed to perform. Employees spent close to an hour digging through a back closet for a couple of mics. When the band discovered that mic-stands were completely out of the question, they had to improvise a little. Now, she prefers the shock factor she often receives when revealing to listeners that she is both a musician and a producer of her own music, which seems to mystify some people due to her gender. “I think that there’s a lot of ego for a lot of people about music in a way that is toxic and misogynistic,” she said. Though she had performed live with her a capella group and Yes Yes A Thousand Times Yes, Eidinger’s first solo show this past July was an entirely different experience. 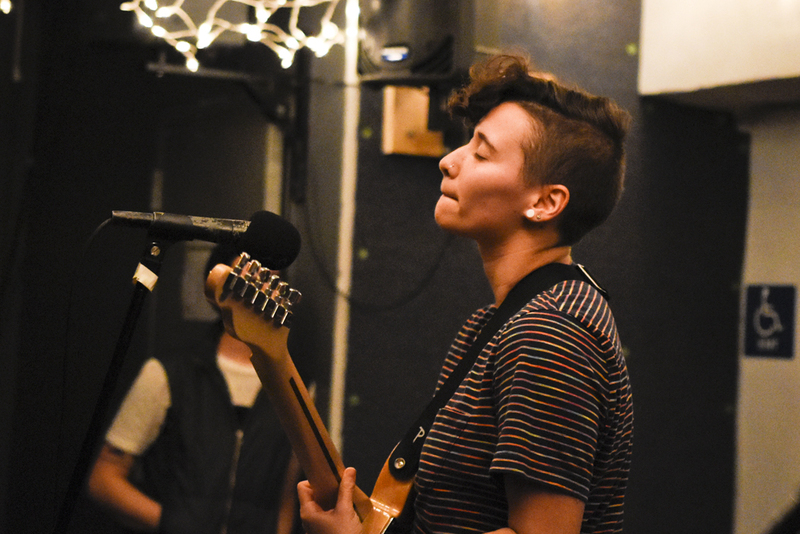 Regardless of her first-time jitters, she said she felt the love from fellow musicians who came out to jam to her rooftop performance at Spider House in Bloomfield. Playing in the band taught her how to get music out to the listeners, gaining press and exposure through social media and generating hype by playing at a wide variety of venues, while releasing music through sites like Bandcamp. The goal for Eidinger is to head East after graduation, back to Philadelphia’s thriving music scene. There, she hopes to assemble a new band, find a new practice space and continue to make new music. “I’ll find my way,” she said.